Lincoln, Nebraska: University of Nebraska Press, 1986. 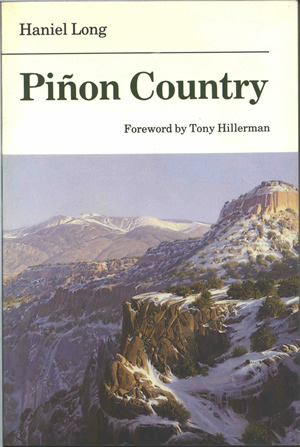 This is Piñon Country by Haniel Long. First published in 1941 by Duell, Sloan, and Pearce, this edition from the University of Nebraska Press contains a foreward by Tony Hillerman. The cover of this paperback volume was designed by Tony Schappaugh. The front cover art is a detail of a painting by Wilson Hurley from 1976 entitled Los Alamos Country and shows a reddish brown rocky outcrop above a sheer drop in the foreground. Piñon and juniper trees dot the landscape, which is covered with snow, and climbs to a high red rock butte on the right and taller mountain peaks capped with snow in the distance. The illustration wraps around the spine and a small portion is visible on the back cover. Three press quotes are printed in black on white on the back cover, above a synopsis of the book and the cover credits. The ISBN and book price are printed at the bottom of the back cover. Binding: Full-color paper covers. The author's last name, the book title, and publisher's logo are printed on the spine.